We have federal funded projects focused on assessing the role of sensory feedback (sensory information) coming from our lower limbs via peripheral nerves onto networks (groups) of cells located in our spinal cord after a spinal cord injury (SCI). We also have projects studying the role of spinal networks and its component neurons in the control of locomotion and its changes due to the use of neuromodulatory substances such as caffeine, ethanol, taurine, and others. To perform the experiments which are relevant to the projects described above, we use electrophysiological techniques, such as intracellular whole-cell patch clamp recordings and extracellular nerve recordings, confocal imaging, and immunohistochemistry. The effects of that neural chemicals known as neurotransmitters or neuropeptides can have on basic mechanisms that occur in our central nervous system is well documented and is known to be very significant. The consumption of known natural or artificial psychostimulants, such as caffeine, by animals or humans can have a significant impact on the short and long-term performance of cognitive and/or motor skills. These results support the stimulant effects of caffeine onto adenosine receptors located within the spinal network controlling walking, acting mostly through the inhibition of A1 adenosine receptors. By studying the effects of psychostimulants on relevant behaviors such as locomotion we can develop a better understanding of how our nervous system deals at the cellular level with this and other kinds of perturbations. Spinal Cord Injury (SCI) is a worldwide epidemic. It is estimated that each year over ninety thousand people suffer a traumatic spinal cord injury, which most have to endure in a wheelchair (information provided by the United Nations Population Division). The average age for sustaining an injury is 33 years (National Spinal Cord Injury Association) but life expectancy after injury is diminished by less than 10 percent. These facts are quite dramatic, which makes SCI an extremely sensitive and ever-growing problem worldwide. Advances in our scientific knowledge of sensory input and its control of movement would allow us to define more precisely the technical requirements for the rehabilitation of patients with SCI thus improving our current clinical strategies. The aims of this proposal are designed to uncover which specific sensory modalities are most effective for a providing a more coordinated and robust motor output. Additionally, we aim to create a better understanding of how these sensory modalities shape the firing properties of the neurons that produce this motor output. These studies expose students from underrepresented groups in science (including hispanics and women) to advanced instrumentation and experimental techniques. Furthering the scientific career of underrepresented groups in science is of high priority in our research laboratory and aligned to the programmatic mission of federal organizations such as the National Institute of Health (NIH) and the National Science Foundation (NSF). Caffeine, a methylxanthine drug, is a potent psychostimulant that can have significant and widely variable effects on the activity of neuronal pathways in the central and peripheral nervous system including the modulation of behaviors such as vigilance, attention, arousal, and locomotor activity. Caffeine is a known inhibitor of the cAMP degrading enzyme cyclic nucleotide phosphodiesterase, but its major neural action is as a nonselective blocker of adenosine receptors (specifically A1 and A2a receptors). The most pronounced caffeine-induced behavioral effect seen in rodents is to increase locomotor activity which has been linked to a dose-dependent inhibition of A1 and A2a adenosine receptors. Most of the studies assessing the effects of caffeine and/or adenosine receptor agonists and antagonists on locomotor behavior have been performed on freely behaving rodents using paradigms such as light–dark behavior, open-field behavior and conditioned place preference, among others. The effects of caffeine at the level of the spinal central pattern generator (CPG) network for locomotion are lacking. We propose to assess the effects of caffeine on locomotor function by studying the spinal CPG network using the neonatal mouse isolated spinal cord preparation. Caffeine, an adenosine receptor antagonist, is a potent psychostimulant that can have significant and widely variable effects on the activity of neuronal pathways in the central and peripheral nervous system. It is the most consumed psychoactive drug in the world, with about 90% of the population (including children) in the United Sates regularly consuming caffeine containing beverages or foods. The effects of caffeine on voluntary muscle activation has been demonstrated in human studies and the central mechanism that may enhance activation are being elucidated (including the interactions of dopamine and adenosine receptors), but studies looking into the effects of caffeine at the level of the spinal locomotor network and component neurons are lacking. We proposes to study the effects of caffeine to the mammalian locomotor central pattern generator (CPG) network by assessing the effects of caffeine on the intrinsic properties of ventral horn neurons (lamina VIII and X) using lumbar cord slices and the patch clamp technique. Spinal Cord Injury (SCI) is a worldwide affliction. In most cases, SCI condemns the afflicted to a life in a wheelchair due to partial or complete loss of motor function. SCI can negatively impact diverse rhythmic motor movements including those related to the maintenance of balance/posture during standing and walking. Trunk motor control is crucial for postural stability and propulsion after SCI and several rehabilitative strategies such as pharmacological and robotic rehabilitation training are aimed at restoring postural support and balance. But these recent strategies have been developed in the absence of detailed knowledge of how the spinal thoracic circuitry, which controls our trunk, is anatomically and functionally organized thus limiting the effectiveness of these treatments. We have evidence which supports our overarching hypothesis that the thoracic neural network in mammals has all the necessary cellular components to produce rhythmic motor activity that can be independent or dependent on the spinal lumbar neural network controlling locomotion. Recent studies have shown that neural networks in the thoracic level are entrained by the lumbar network during locomotion while we propose that locomotion-independent thoracic rhythmic patterns are produced by a half-center circuit organization which is likely evolutionarily conserved from limbless vertebrates such as the lamprey and tadpole. Our theory is also supported by studies in lower vertebrate tetrapods such as the salamander and newt providing experimental evidence of the existence of a hybrid thoracic network capable of producing different motor patters during swimming (trunk only) and walking (limb-trunk). Thus the principal goals of this project are to build on these findings and identify the principal neural components of the neural network that controls trunk-related motor activity. Additionally, we will assess the effects of sensory feedback onto thoracic motor activity using a novel spinal cord-muscle attached preparation in neonatal mice providing key information on the cellular organization and functionality of the thoracic sensorimotor circuitry during early postnatal life. controls the output properties of the spinal CPG network. signals within nervous systems and other complex three-dimensional structures. Role: Co-PI; no direct research support. Neurobiology (San Juan, PR), a facility that belongs to the University of Puerto (School of Medicine). Role: Co-P.I; no direct research support. system and 2) an obsolete network cyberinfrastructure. URM: Mentoring program in neural circuits and behavior at the Univ. of Puerto Rico. students at the University of Puerto Rico. Ferré S, Quiroz C, Guitart X, Rea W, Seyedian A, Moreno E, Casadó-Anguera V, Díaz-Ríos M, Casadó V, Clemens S, Allen RP, Earley CJ, García-Borreguero D. Pivotal Role of Adenosine Neurotransmission in Restless Legs Syndrome. Front Neurosci. 2018 Jan 8;11:722. doi: 10.3389/fnins.2017.00722. eCollection 2017. Diaz-Ríos M, Guertin PA, Rivera-Oliver M. Neuromodulation of Spinal Locomotor Networks in Rodents. Curr Pharm Des. 2017;23(12):1741-1752. doi: 10.2174/1381612823666170124111729. Review. Cabezas-Bou E, De León-Arbucias J, Matos-Vergara N, Álvarez-Bagnarol Y, Ortega-Guzmán J, Narváez-Pérez K, Cruz-Bermúdez ND, Díaz-Ríos M. A Survey of Energy Drink Consumption Patterns Among College Students at a Mostly Hispanic University. J Caffeine Res. 2016 Dec 1;6(4):154-162. doi: 10.1089/jcr.2016.0011. 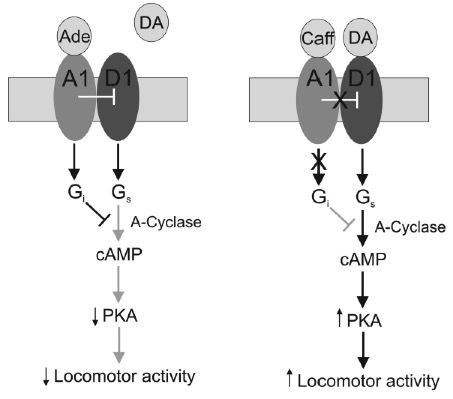 Acevedo J, Santana-Almansa A, Matos-Vergara N, Marrero-Cordero LR, Cabezas-Bou E, Díaz-Ríos M. Caffeine stimulates locomotor activity in the mammalian spinal cord via adenosine A1 receptor-dopamine D1 receptor interaction and PKA-dependent mechanisms. Neuropharmacology. (2016) 101:490-505. doi: 10.1016/j.neuropharm.2015.10.020. Rivera-Oliver M, Diaz-Rios M. Using caffeine and other adenosine receptor antagonists and agonist as therapeutic tools against neurodegenerative diseases: a review. Life Sci. (2014) 101(1-2):1-9. doi: 10.1016/j.lfs.2014.01.083. Acevedo JM, Diaz-Rios M. Removing sensory input disrupts spinal locomotor activity in the early postnatal period. J Comp Physiol A Neuroethol Sens Neural Behav Physiol. (2013) 199(12):1105-16. doi: 10.1007/s00359-013-0853-3. Díaz-Ríos M., Dombeck D., Webb W.W., and Harris-Warrick R. M. Serotonin modulates dendritic calcium influx in commissural interneurons in the mouse spinal locomotor network. (2007) J Neurophysiol 98(4):2157-67. Wilson J., Dombeck D., Díaz-Ríos M., Harris-Warrick R.M., and Brownstone R.M. Two-photon calcium imaging of network activity in XFP expressing neurons in the mouse. (2007) J Neurophysiol. 97(4):3118-25. Zhong G., Díaz-Ríos M., and Harris-Warrick R.M. Intrinsic and functional differences among commissural interneurons in the central pattern generator for locomotion in the neonatal mouse. (2006) J Neurosci. 26(24):6509-17. Díaz-Ríos M., and Miller M.W. Target-specific regulation of synaptic efficacy in the feeding central pattern generator of Aplysia: Potential substrates for behavioral plasticity? (2006) Biol Bull. 210(3):215-29.